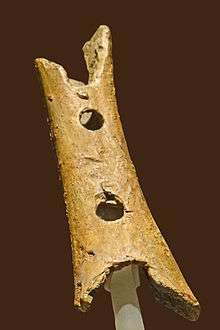 The Divje Babe Flute is a cave bear femur pierced by spaced holes that was found in 1995 at the Divje Babe archeological park located near Cerkno in northwestern Slovenia. It has been suggested that it was made by Neanderthals as a form of musical instrument, its hole spacing and alignment leading to its being labeled a "Neanderthal flute". Slovenian archeologist Mitja Brodar, however, argues that it was made by Cro-Magnons as an element of Central European Aurignacian culture. If it is a form of flute, it is possibly the world's oldest known musical instrument. Alternative hypotheses notwithstanding, the artifact remains on prominent public display as a flute in the National Museum of Slovenia (Narodni Muzej Slovenije) in Ljubljana. The museum's visitor leaflet maintains that manufacture by Neanderthals "is reliably proven". Divje Babe is the oldest known archaeological site in Slovenia. The site is the location of a horizontal cave, 45 metres (148 ft) long and up to 15 metres (49 ft) wide. It is located 230m above the Idrijca River, near Cerkno, and is accessible to visitors. Researchers working at this site have uncovered more than 600 archaeological finds in at least ten levels, including 20 hearths and the skeletal remains of cave bears, and have studied climate change during the pleistocene. According to the museum, the presumed flute has been associated with the "end of the middle Pleistocene" and the time of Neanderthals, about 55,000 years ago. This is not the only such site in Slovenia. In the 1920s and 1930s, the archeologist Srečko Brodar discovered tens of bones with holes in another site, Potok Cave (Slovene: Potočka zijalka) in the Eastern Karavanke, but almost all of them were destroyed during Italian occupation of Ljubljana in World War II. The best known of them, still preserved, is a mandible of a cave bear with three holes in the mandibular canal. Potok Cave, a cave in the Eastern Karavanke, where the remains of a human residence, dated to the Aurignacian (40,000 to 30,000 BP), including a bone flute, were found by Srečko Brodar in the 1920s and 1930s. This marks the beginning of Paleolithic research in Slovenia. Since World War II, specimens have also been found in Mokrica Cave (Slovene: Mokriška jama), Betal Rock Shelter (Betalov spodmol), and elsewhere. These bones are preserved today at the National History Museum of Slovenia in Ljubljana, the capital. According to the archeologist who discovered many of them, Mitja Brodar, bones with holes were never found in the Western Europe, and they have been dated only to the end of the Mousterian and the beginning of the Aurignacian. Such bones were discovered also elsewhere in Central Europe, but in a much lower number, and it is unlikely that cave bears would make such holes only in Central Europe and only in a specific period. That these bones are still not recognised by international research community Mitja Brodar attributes to the fact that most of the bones were found on the territory of France and the Paleolithic is still considered to be the French domain, although not a single bone with holes have been found there. The only bone point with a hole ever discovered was found in Potok Cave. According to Brodar, such holes are an element of Central European Aurignacian. They have been ascribed to the Cro-Magnon, modern human. According to Brodar, the Divje Babe Flute is a product of modern humans as well, but this has been disputed by other Slovene scholars. In 1995, Ivan Turk found an approximately 43,100-year-old  juvenile cave bear femur at the Divje Babe site, near a Mousterian hearth. Because it has characteristics of a flute, he has called it a "Neanderthal flute". Whether it is actually a flute created by Neanderthals is a subject of debate. It is broken at both ends, and has two complete holes and what may be the incomplete remains of one hole on each end, meaning that the bone may have had four or more holes before being damaged. The bone fragment is the diaphysis of the left femur of a one- to two-year-old cave bear, and is 113.6 mm long. The maximum diameters of the two complete holes are 9.7 and 9.0 mm. The distance between the centers of the holes is 35 mm. If the bone is a flute, it would be evidence of the existence of music 43,000 years ago. Thus Ivan Turk has asserted that whether the holes are of "artificial" (made by man) or "natural" (punctures from a carnivore bite) origin is the "crucial question." The bone has become a noted attraction in the National Museum of Slovenia, publicized on official Slovenian websites aired on TV with tunes played on a clay replica and is a source of pride for the country. In the West, paintings were made, models constructed, and musicians such as biology professor and flautist Jelle Atema have played them publicly. French-based Italian taphonomist Francesco D'Errico (et al., 1998), Holderman and Serangeli (1999), as well as Chase and Nowell (1998, 552) hypothesized its carnivore origin. The probability that four randomly placed holes would appear in line in a recognizable musical scale is on the order of a few in several million, according to an analysis made in 2000 by Canadian musicologist Bob Fink. Responding to the D'Errico et al. 's carnivore-origin hypothesis, Turk (2005, 2006) pointed out that the features "common" between the carnivore-origin artifact and other chewed bones studied by D'Errico (see "Hole shape" below) do not include the alignment of the holes. There is also no evidence that the two holes could have been bitten at the same time. The tooth spans were analyzed by all taphonomists concerned to see if any animals could bite two or more such holes at once. No match could be found to any known animals. If a match had been found, it could have been cited as prima facie evidence that the holes were animal-made. This was noted by Turk, et al. in his monograph, and was also noted from the opposing hypothesis holders Nowell and Chase in their article in the August–October 1998 issue of Current Anthropology. Nowell et al. wrote that holes in the specimen "were almost certainly made sequentially rather than simultaneously and that the distance between them has nothing to do with the distance between any two teeth in a wolf's jaw." Iain Morley, despite his holding the carnivore-origin hypothesis, in an additional observation to his November 2006 article observed that "[W]hilst the collections of cave bear bones examined by D'Errico et al. (1998), as well as those discussed by Turk et al. (2001), do show similar shaped and damaged holes ... none of these occur in the diaphysis of a femur", as is found on the reputed flute. Marcel Otte (director of the Museum of Prehistoire, Universite de Liege, Belgium) pointed out in a Current Anthropology (April 2000) article that there is a possible thumb-hole on the opposite side of the Divje Babe bone, which, making five holes, would perfectly fit a human hand. D'Errico et al. made an analysis of the artifact in comparison to cave-bear bone accumulations where no hominid presence was known. They published photos of several bones with holes in them which had more-or-less circular holes similar to those found in the artifact, but they did not have a single bone coming even close to the linear alignment of Turk's holes. Ignoring the probability of the alignment of the holes, D'Errico et al. 's interpretation was that it was possible for the holes to have been made by an animal, and they concluded that of the available options this was the most likely. D'Errico insisted on ignoring the probability of the alignment of the holes and, even after having analyzed the artifact firsthand, claimed that "the presence of two or possibly three perforations on the suggested flute cannot therefore be considered as evidence of human manufacture, as this is a common feature in the studied sample." Turk conducted laboratory experiments which pierced holes in fresh bear bones in the manner of carnivore punctures, and in every case, the bones split. Yet in the Divje Babe instance, the bone did not break, a fact not matching expectations of carnivore action, as Turk's results showed. Turk wrote, in his monograph and in his article in MIT's Origins of Music anthology, the bone shows no "counter-bites" that one would normally expect on the other side of the bone matching the immense pressure necessary for a bite to make the center holes. Turk's 1997 monograph reported that the holes have similar diameters which would accommodate fingertips, and all are circular instead of oval (as carnivore bites often are). Furthermore, all are in the proper ratio of bore size to hole size found in most flutes, and the bone is the kind (femur) usually used for bone flutes. An examination of the specimen using computed tomography was published in 2005 by Ivan Turk et al., in which he concluded that "the two partially preserved holes were formerly created before the damage...or before the indisputable intervention of a carnivore." Turk, et al. (in the monograph Moussterian Bone Flute, p. 160) wrote that "the marrow cavity is basically cleaned of spongiose. The colour of the marrow cavity does not differ from the colour of the external surface of the bone. So we may conclude that the marrow cavity was already open at the time.... Otherwise, it would be a darker colour than the surface of the bone, as we know from coloured marrow cavities of whole limb bones." In a 2011 article Matija Turk published the results of a collaboration with Ljuben Dimkaroski, an academic musician who had made replicas of the artifact. The authors argue that the instrument encompassed a range of two and a half octaves, which can be extended to three octaves by overblowing. Dimkaroski created over 30 wooden and bone replicas of the flute and experimented with them. The replicas were made from femurs of juvenile brown bears provided by the Hunters Association of Slovenia, but also calf, goat, pig, roe and red deer bones. In the end he concentrated on playing a replica made on a femur of a juvenile cave bear from Divje babe I, to come as close as possible to the dimensions of the original. 1 2 3 Brodar, Mitja (26 September 2008). ""Piščalka" iz Divjih bab ni neandertalska" [The Divje Babe "Flute" is not Neanderthal] (in Slovenian). ↑ Omerzel-Terlep, Mira. "Koščene piščali: pričetek slovenske, evropske in svetovne instrumentalne glasbene zgodovine" [Bone flutes: Beginning of the history of the instrumental music in Slovenia, Europe, and world] (PDF). Etnolog (in Slovenian): 292. ISSN 0354-0316. ↑ Omerzel-Terlep, Mira. "Koščene piščali: pričetek slovenske, evropske in svetovne instrumentalne glasbene zgodovine" (PDF). Etnolog (in Slovenian): 292. ISSN 0354-0316. ↑ Blackwell, Bonnie A. B. (2006). "Electron Spin Resonance (ESR) Dating in Karst Environments" [Določanje starosti v krasu s pomočjo elektronske spinske resonance (ESR)] (PDF). Acta Carsologica. Ljubljana: SAZU, IZRK ZRC SAZU. 35 (2): 123–153. ISSN 0583-6050. ↑ "Neanderthal Man Moves Up the Evolutionary Scale" Times (London), April 5, 1997. ↑ Chase, Philip G.; Nowell, April (1998). "Taphonomy of a Suggested Middle Paleolithic Bone Flute from Slovenia". Current Anthropology. 39 (4): 549–53. doi:10.1086/204771. ↑ Journal of World Pre-history pp. 36–39, Vol 17, #1, March 2003. ↑ "Early Music". Science. 276 (5310): 203g–205. 1997. doi:10.1126/science.276.5310.203g. Retrieved 2015-05-27. ↑ Turk, Matija; Dimkaroski, Ljuben (2011). "Neandertalska piščal iz Divjih bab I: stara in nova spoznanja" [Neanderthal flute from Divje babe I: old and new findings]. In Toškan, Borut. Drobci ledenodobnega okolja. Zbornik ob življenjskem jubileju Ivana Turka [Fragments of Ice Age environments. Proceedings in Honour of Ivan Turk's Jubilee] (PDF). Ljubljana: Založba ZRC, ZRC SAZU. pp. 251–65. ISBN 978-961-254-257-3. D'Errico, Francesco; Villa, Paola; Llona, Ana C. Pinto; Idarraga, Rosa Ruiz (1998). "A Middle Palaeolithic origin of music? Using cave-bear bone accumulations to assess the Divje Babe I bone 'flute'". Antiquity. 72 (275): 65–79. Bower, B. (1998). "Doubts Aired over Neandertal Bone 'Flute'". Science News. 153 (14): 215. doi:10.2307/4010441. Fink, Bob (1997). Neanderthal Flute. Greenwich. ISBN 0-912424-12-5.